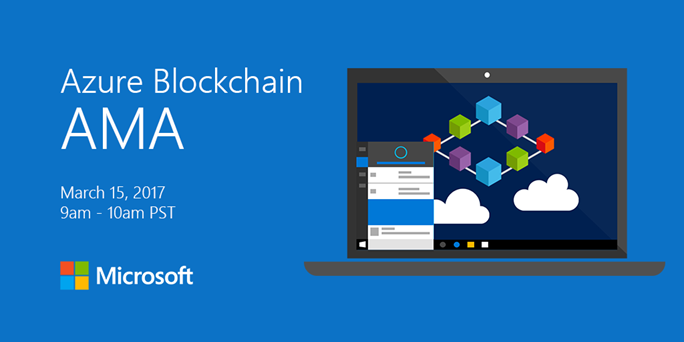 Join us Wednesday, March 15th at 9am PST/12pm EST for the first Azure Blockchain-hosted Ask Me Anything (AMA) on Microsoft Tech Community. We receive great feedback and input about blockchain through customer engagements and other channels, but we haven’t interacted broadly in real-time, until now. You’ll be able to connect directly with the Blockchain team, who will be on hand to answer your questions and listen to feedback. Add the AMA to your calendar! We’ll have folks from the Azure Blockchain engineering team available to answer any questions you have. You can ask us anything about our products, services, or even our team! Why are we doing an AMA? What is Microsoft’s strategy around blockchain? Why have blockchain on Azure? What are the most common blockchain scenarios for industry X or vertical Y? How do I submit blockchain feature requests? Who will be at the AMA? We’ll have PMs, developers, and technical thought leaders from the Azure Blockchain engineering team. We’re looking forward to this AMA and to connect with you directly.